Welcome to the Triad Foundry Homepage! Check out our On-line Catalog! where you'll find our giftware and examples of the custom products Triad Foundry can make for you. Triad Foundry is located in Kernersville, North Carolina. 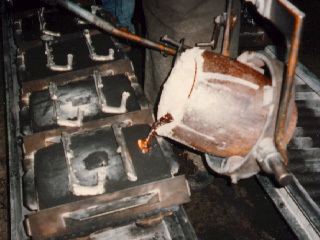 We make sand castings in brass, aluminum, and white bronze. Current products include reproductions for antique furniture hardware and car parts, gift ware, small and medium parts for machinery, handles, hooks, brass gutter hooks, and prototypes. 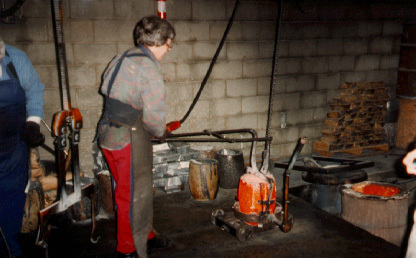 Triad Foundry can make reproductions of existing parts, replacements for broken or damaged parts, or custom pieces. Original parts can be used as patterns, or we can have a pattern made. Sizes are limited to less than 24 inches and weight under 30 pounds. Quantities from one to several hundred, one time orders, or repeats. No job is too small for Triad Foundry.